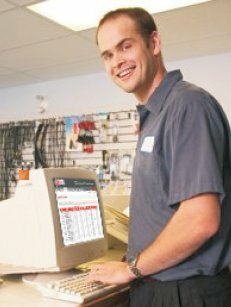 The PartsEye innovative web based inventory planning and management system works with each dealer’s parts department. It utilizes current and past parts sales as well as lost sales and a variety of other measurements from each individual dealer’s sales demand. With this data, PartsEye forecasts sales for each dealer based on individual dealer and broader regional and national demand using the exclusive SmartCast methodology. Based on SmartCast, an optimal stocking level is established for each dealer. From this optimized stocking level, PartsEye prepares a suggested stock order on whatever frequency the user chooses (daily, bi-weekly, weekly, or other). Each dealer’s parts manager has final review and complete editing rights for each stock order, using the PartsEye web interface, before it is placed with the supplier. The PartsEye system is integrated with each dealer management system collecting daily demand, sales and lost sales data via the Internet. This data is stored in a central database of individual demand history and aggregate demand history of localized districts, regions, and PDC’s. SmartCast uses this database to calculate optimal stocking levels for each dealer location based on both individual demand as well as the demand trends in the local region or district. Once demand levels have been calculated, daily processing occurs allowing for calculated stock orders. The key factor in the PartsEye system is that all processes are reviewed on a regular basis by specialized parts planners who are removed from day to day interruptions and corporate distractions in the dealership. Usually focusing on one brand, these planners build a rapport with each dealer’s parts manager to allow for total teamwork. Maintaining regular communication with each dealer's parts manager also helps to assure that all exceptions in the ordering process are accounted for. Additional features included in the PartsEye service, without any added costs, are calculated stock returns, inventory analysis, the SmartGauge key performance indicators review page, and a parts locator for dealer to dealer use as well as retail use if desired. The PartsEye database can also be linked with the manufacturer or distributor ordering system to provide for Dealer to Dealer (D2D) order shipment of critical parts orders with limited availability.